The Quantum Realm is probably the biggest new concept that the Ant-Man movies have introduced into the MCU. The mini-universe that can be accessed when a shrinking hero goes subatomic is a whole other psychedelic-looking dimension that, even though it’s featured in two films so far, we still know very little about. We’ve been told that humans can survive in the QR – Janet Van Dyne did for 30 years – but are there any other inhabitants? Well, in early plans for Ant-Man and the Wasp, there were. 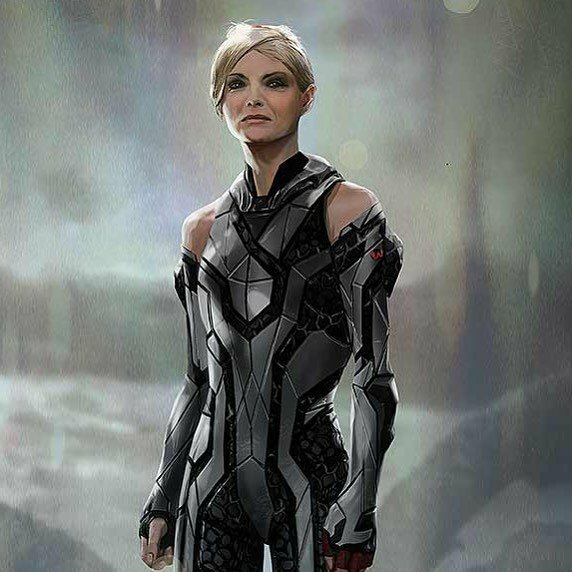 Marvel Studios artist Aleksi Briclot shared a piece of concept art on his Instagram account this week that featured an alternative costume for Michelle Pfeiffer’s original Wasp. This outfit appears to made up of some advanced tech and the reason it didn’t ultimately appear in the sequel was because it was ditched alongside plans to include a hi-tech civilization located in the Quantum Realm. The most likely reason that the idea of a Quantum Real civilization was abandoned was to streamline the film. After all, much of Janet’s material in Wasp was left out of the theatrical cut, with director Peyton Reed promising that more footage of the character will be found on the home video release’s deleted scenes. However, if we wear our conspiracy theory hat for a moment, it’s possible that the concept was kept back for Avengers 4. Ant-Man and the Wasp ended with Scott Lang trapped in the Quantum Realm following Infinity War‘s Snap. The time-travelling movie is expected to make use of the dimension, so it would make sense to explore it a little more and reveal that there are civilizations within it. But who knows, that’s just our two cents.